THE EXHIBITION "NATALIA GONCHAROVA. EAST AND WEST" AT THE TRETYAKOV GALLERY CASTS LIGHT ON MANY ASPECTS OF GONCHAROVA'S ARTISTIC DEVELOPMENT, INCLUDING THE INFLUENCE ON HER EARLY WORKS OF PAUL GAUGUIN. THE 1989 EXHIBITION "GAUGUIN. A VIEW FROM RUSSIA" AT THE PUSHKIN MUSEUM OF FINE ARTS HAD ALREADY AFFORDED AN OPPORTUNITY TO EXPLORE1 THE IMPACT OF THE FRENCH MASTER'S PAINTINGS ON THE RUSSIAN ARTIST. BUT THE NEW SHOW OFFERS A WIDER PERSPECTIVE ON THE SUBJECT. 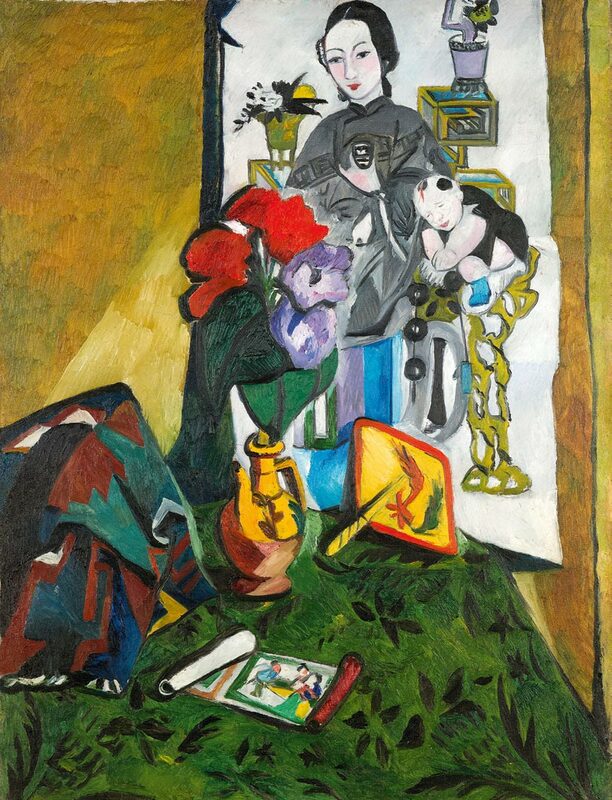 Gauguin fascinated, for a while, both Goncharova and Mikhail Larionov. Larionov managed to visit Gauguin's solo exhibition in 1906 in Paris, and although Goncharova did not have the chance to do so, Larionov passed on to her the much-needed "Gauguin infection". In addition, Goncharova did see some of Gauguin's pictures owned by the Moscow collectors Sergei Shchukin and Ivan Moro-zov, pieces that were avidly studied by both artists2. Like Gauguin, Goncharova and Larionov created not only painting but also sculptures, using the French artist's favourite materials, wood and clay. Goncharova was keen on clay-modelling, while Larionov in his "Self-portrait in a Turban" (c. 1907, Tret-yakov Gallery) pictured himself beside a relief he himself had carved from a wood block4. Both artists' paintings show Gauguin's impact too. 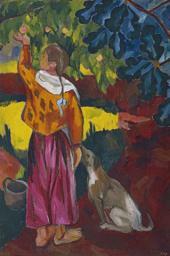 Larionov's "A Gypsy Woman" (1908, private collection, France) features contrasts between the shaded foreground and sunlit background similar to those in Gauguin's "Fruit Gathering"; analogous techniques were used in Goncharova's "Fruit Harvest" (1908, Russian Museum), that was an undisguised homage to Gauguin's similarly themed work. 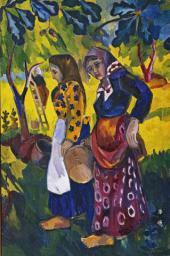 Nevertheless, Larionova and Goncharov experienced Gauguin's art differently. Larionov's take on his environment was charmingly ambivalent, invariably filled with both affection and humour. That was the way in which he treated the barbers' shop signs of Tiraspol, of which he was so fond: he both admired their simple-heartedness and at the same time mocked their simplicity. Almost the same kind of ambivalence informed his attitude to Gauguin's world. It was a world that fascinated him with its exotic exuberance of colour and unrestrained existence of a pristine nature, but at the same time Larionov was ready to make fun of Gauguin's characteristic "high notes". As is well known, while working on "Fruit Gathering", Gauguin used photographs of the Parthenon reliefs, trying to bring out classical features in the native people's movements. 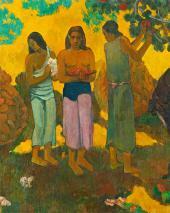 Such aspirations were alien to Larionov, and some of his images look like a parody of Gauguin's popular compositions. His "Gypsy Woman", with her sagging breasts, appears to be a response to the augustly graceful, nearly statuesque "Woman Holding a Fruit" (1893, Morozov collection), while the bathing women's poses in the composition "Village Bathers" (Kovalenko Regional Art Museum, Krasnodar) stop just short of being a mockery of the chaste poses of the Tahitian women in the composition "Aha oe Feii (What Are You Jealous)?" (1892, Shchukin collection). The 1910 image of Wladimir Burliuk (Museum of Fine Arts, Lyon), created in Burliuk's Chernyanka - an even more "Tahitian" place than Larionov's Tiraspol - features Gauguinesque colours suitable for the occasion, but the sitter holds, not a vessel made of an exotic fruit, but a dumb-bell (a strong man, Burliuk was a keen athlete). Such notes of irony liberated the consciousness: the object of mockery was the sway held by such figures of authority, which the French mattres were then already becoming in Russia. Sending up such established cultural icons was for Larionov a way of moving forward, doing the same job as reality itself, which is constantly discarding outdated values. 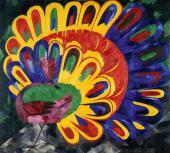 As for Goncharova, she became earnestly fascinated with Gauguin, at first with a childlike naivete. For instance, when she saw in "Fruit Gathering", from the Shchukin collection, the puppies she so liked, she immediately inserted them into her recently accomplished composition "Lady with a Parasol" (in a private collection), although the puppies hardly matched either the message or the artistry of the piece. 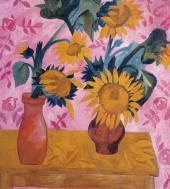 Goncharova studied the French artist's still-lifes with interest and eagerly adapted their motifs - for instance, the sunflower imagery ("Sunflowers", from the Shchukin collection), building on the basis of it several superb compositions (in the Tretyakov Gallery, Russian Museum, and a Moscow private collection5). Gauguin was fond of introducing into his still-lifes the islanders' figures or heads (the already-mentioned "Sunflowers" or "Bouquet de fleurs" from the Morozov collection); in Goncharova's staged compositions, too, the backgrounds were formed of figures and faces ("Still-life with a Portrait and a White Table Cloth", 1908-1909, Russian Museum). 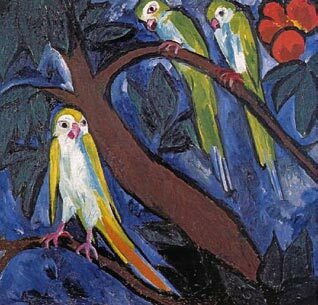 Shortly after Goncharova saw a terracotta figurine of Hina (the Tahitian goddess of the moon), which was undoubtedly made by Gauguin himself, in his "Still-life with Parrots" in the Morozov collection, she began to fill her compositions with similar statuettes. Whereas Gauguin had to invent the figures of Tahitian gods that no one knew about, Goncharova drew her inspiration from "Russian" (as she put it) kamennaya babas, the stone statues found near ancient tumuli, small-sized images of which she made of clay. Goncharova's babas, neither baked nor replicated in gypsum, have not survived, but they are featured in still-lifes such as "Kamennaya Baba" (1908, Regional Fine Arts Museum, Kostroma), "Still-life with a Pineapple" (1909, Tretyakov Gallery), "Bundles and a Kamennaya Baba" (1908-19096, Art Gallery of Smolensk Open-Air Museum). Remarkably, the standing clay statuette imaged on the two latter pictures was used in the composition "Pillars of Salt" (1909-1910, Tretyakov Gallery) - a piece which was already a considerable departure from the Gauguinesque style. 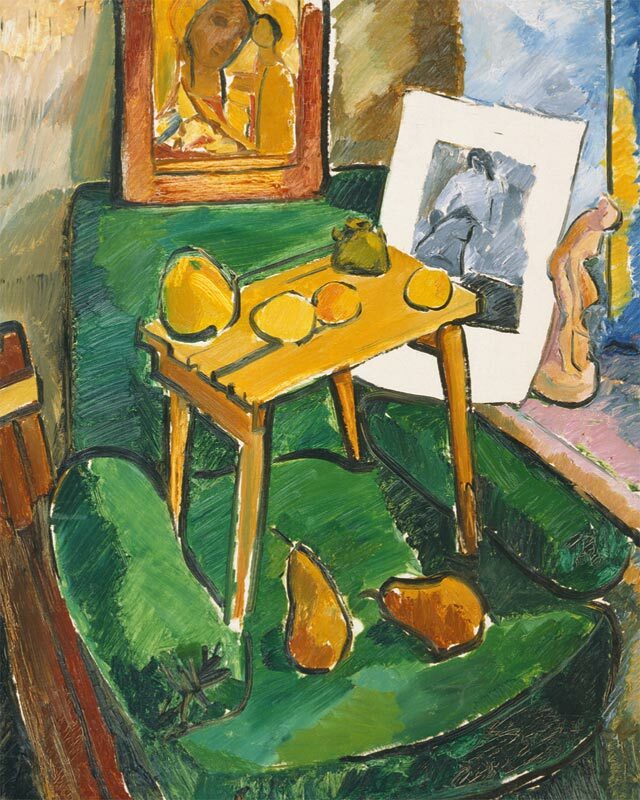 Gauguin's still-lifes influenced not only Goncharova's choice of objects. As is well known, early in the 20th century in Russia the still-life genre, which had been nearly forgotten in the second half of the previous century, was experiencing a revival. The 1910s saw the rising popularity of Paul Cezanne's techniques of still-life - with tables placed in parallel to the canvas, the space delimited with a back wall. In the 1900s, however, such Cezannesque tables with their obligatory napkins, bottles and white plates with fruit, had not yet taken hold among Russian artists. 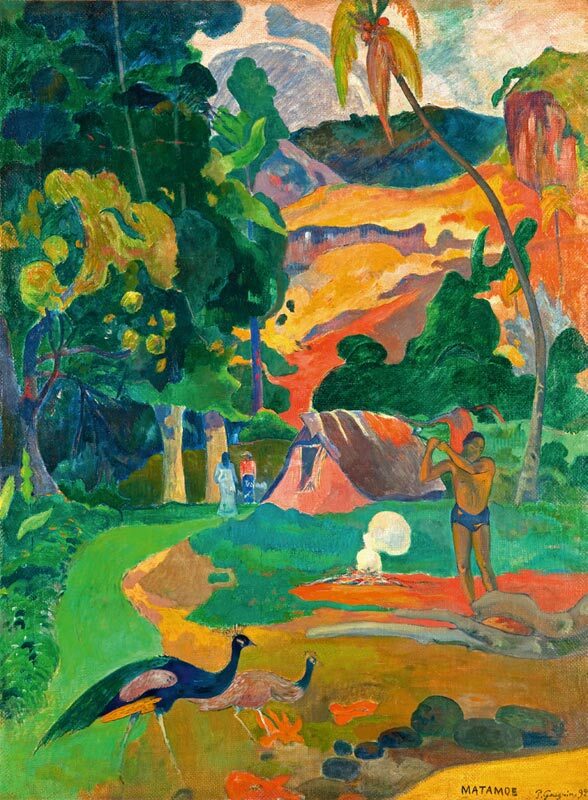 There was a search for individualized and very different idioms (offered by Mikhail Larionov, Nikolai Sapunov, Konstantin Korovin and others), which were sometimes more dynamic compositionally, so the compositional techniques promoted by Gauguin could be viewed as consonant with the spirit of the times. What mattered for Gauguin in his compositions was not depth but, above all, the plane. In many of his pieces - for instance, in "Landscape with Peacocks" (1892, Morozov collection) - the image is constructed from several planes built one over another: the bottom section with the peacocks is superimposed with small human figures and a hut, while on an even higher plane, there is a landscape with trees and hills, optically no more distanced from us than the pair of peacocks below. A landmark feature of Gauguin's art is his elongated human figures strung along the surface of a painting. This is how the subjects, the people of "Fruit Gathering" or "Teavae no Maria (The Month of Mary)" (1899, from the Shchukin collection) are imaged, and the viewer's eye moves not from the bottom upwards but from the top down. In "Man Picking Fruit from a Tree" (1897, from the same collection) our eyes are first turned to the Tahitian's man face and his arms stretched up to the leaves of the trees, and only then do we look down, to the soles of his feet, which barely touch the ground. 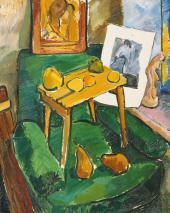 Similar techniques were used in Gauguin's still-lifes (I mention only those pictures that Goncharova had seen in the Moscow collections). 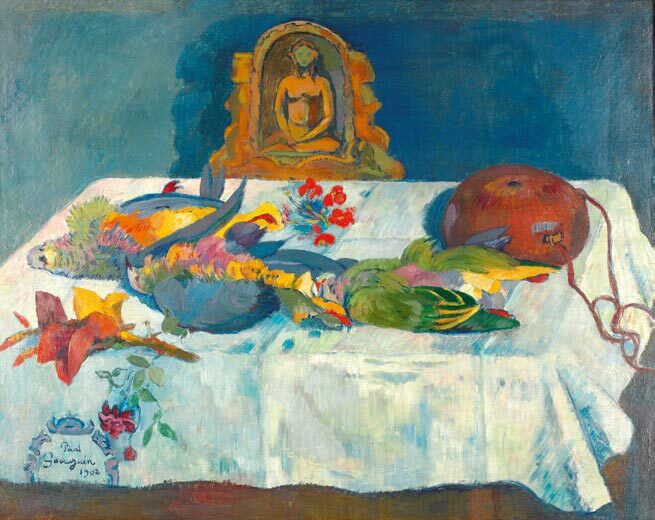 In "Still-life with Parrots" (1902) we see the Hina figure above, and only then do we look down to the plumages of the motley-coloured birds laid out on a light-toned table cloth, then further down, at the angle at which the table is tilted, until our glance, together with the table cloth, slides down to the very bottom. An even clearer movement of the eyes is evoked in the still-life "Sunflowers". At the top there is a "mystical eye", placed in the centre of the flower, then below an armchair with a basket full of sunflowers, their petals either perked up in excitement or, on the contrary, drooping, and, finally, the lowest section featuring the seat of a heavy armchair (an altogether neutral image). 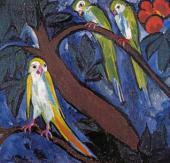 Goncharova adopted these compositional techniques. Her still-life "Fruits and Engraving" (1907-1908, Tula Museum of Fine Arts) draws both on "Landscape with Peacocks" and "Sunflowers". Instead of Gauguin's clay Hina, at the top of this composition Russia's own national "godling" is featured - a little icon of the Mother of God with the Infant. The colour of this icon gives it a ceramic look (a real clay statuette of a bent female figure is placed to one side, on the window sill). And below the icon stands a heavy green armchair, like in Gauguin's "Sunflowers". (Perhaps this armchair, with its seat sagging to the floor, is the one which was a permanent fixture in Goncharova's and Larionov's studio on Trekhprudny lane: a reporter from one of Moscow's newspapers wrote that when you sat on it, your knees were lifted to the level of your chin.) On the armchair, instead of a basket with sunflowers, stands a stool with fruits, from which our glance moves down to the pears on the seat of the armchair: the pears' dark contours echo the denser lineaments of the armchair. 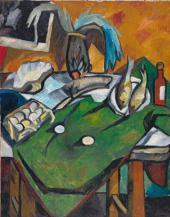 The same movement of the eyes is invited in the composition "Fish and Brush" (1909, Tretyakov Gallery): here we see a similar cumbersome armchair, only turned upside down and placed on the corner of the table, so that we see the reverse of its back, covered with the same green cloth. On top there is a pot with a nearly dance-like gesture of leaves spread widely (the most eye-catching "event" of this composition), from which the eye moves down, "bumping" over the fishes, the box with eggs and the brush, then further down to the green planes of the armchair, before reaching the bottom edge of the canvas. The artist's (and, accordingly, the viewer's) eye is initially positioned at the top of the composition, and everything below this level is viewed as if "in passing", "in a breath". In "Sunflowers" (1908-1909, Russian Museum), there are ecstatic silhouettes of large green leaves on top, with a table painted in a more composed manner below. In "Chinese Still-life" (с. 1910, Tretyakov Gallery) our attention is focused on a Chinese popular print, while we can altogether forget to look at the objects lying on the table underneath. We should keep in mind that Larionov (working on still-lifes in the 1900s), also painted objects as viewed from head height, and often against the backdrop of a plank floor, rather than a wall. But in his pictures the main objects are situated at the centre of the composition (which is most often square-shaped) and do not direct our glance either downwards or sidewards. In Goncharova's paintings the vertical formats give them a resemblance to images applied to a screen - a sequence of objects perceived by the eye as it glides along the screen from the top down. The composition of "Geranium Still-life" (1908-1909, Tretyakov Gallery) is constructed similarly to Gauguin's "Landscape with Peacocks": an array of incarnadine flowers radiant against a white backdrop on top, then below them geranium foliage against hanging fabrics and, finally, a selection of fruits against the backdrop of the table - visually they are at the same distance from us as the red geraniums at the top of the picture. Goncharova's figurative pieces have a similar composition. In order to emphasise the vertical alignment of the female figures, Goncharova divided her own "Fruit Harvest" into four sections. It is noteworthy that the"horizon" in these sections is located on the same level as the big drooping oak tree leaves (the inspiration for this image is drawn from Borisov-Musatov's "Emerald Necklace" (1903-1904, Tretyakov Gallery) as well), with the figures and summer landscape consisting of sharply delineated spots of shade and sunlight located even lower. Speaking about the echoes of Gauguin's art in Goncharova's work, one should also pay due regard to more substantive aspects of each artist's work. If we apply the most general classification of European art trends, both Goncharova and Larionov belonged with Gauguin's version of Post-impressionism rather than Cezanne's. Larionov is connected with nature's vital force. 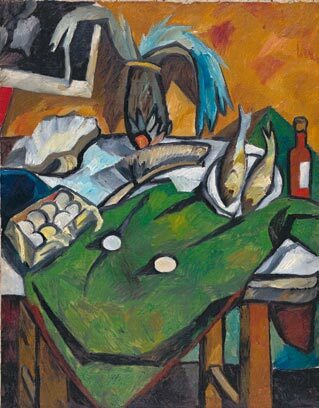 His "fishes" do not appear as nature mortes not because they lie right under the feet on the grass, rather than on the table: they are (as in Gauguin's paintings) a "living life", and Larionov almost never wavered in this approach. His pears are very nearly living things: in "Marigolds and Phyllocactuses" (1910, Pompidou Centre, Paris) the pears liberally "straggle" across the table, some lying still (like geese), others perking up their little necks. 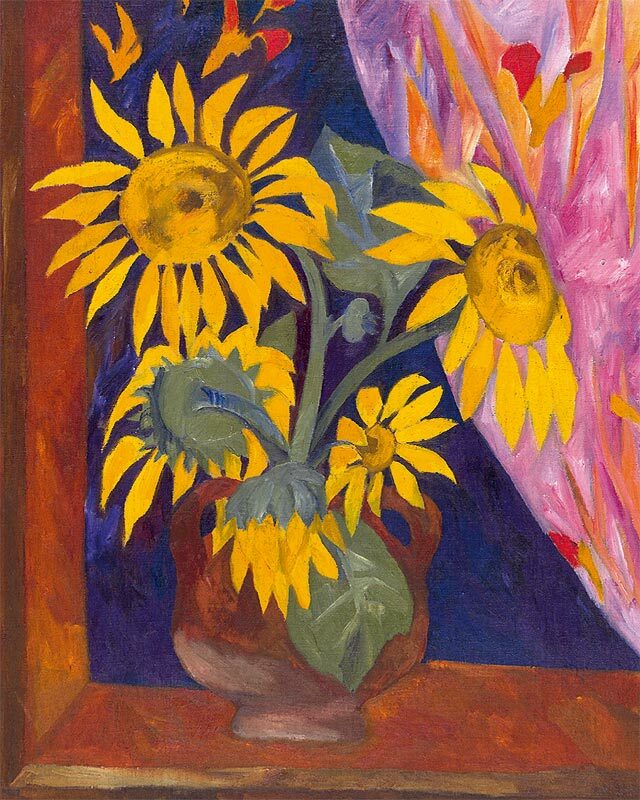 Exactly the same can be said about the art of Goncharova, who, in her early period, was attracted not by dry pine-trees and hills as Cezanne was, but by growing grasses; and in still-lifes, not by tables and napkins, but, most of all, by flowers. Moreover, both artists followed the same path in developing primitivist techniques. Marina Bessonova pointed to Gauguin's early period, with its images of Breton women "resembling stone statues... with huge disproportionate hands and feet". According to her, it was "in the fishermen's village Le Pouldu" - in 1889, that is before his trips to Polynesia - that Gauguin produced "the first ever 'primitive' style in the history of arts", which later inspired many European artists7. 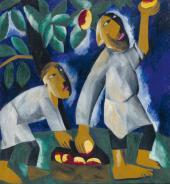 Something similar can be said about Goncharova: she became interested in Primitivism (even before her encounter with Gauguin's art) after she saw peasant women in Kaluga or Tula: her "Planting Potatoes" (1907-1908, Tretyakov Gallery) already features piles of potatoes looking like boulders, which the figures of the peasant women also resemble. There was a direct path from this bent-over peasant woman to the even bulkier female frame, bent over a pile of apples, in "Fruit Harvest". Like Gauguin's Breton women, the figures in Goncharova's pictures would increasingly appear either modelled from clay or carved from wood, with "disproportionately big hands and feet". The differences between the artists should be reviewed, too: some were evident from the moment of their "encounter", while others grew over the years. Goncharova's early pieces are more artless and simple than the French master's works, but sometimes more energetic in highlighting particular shades of meaning. Whereas Gauguin after Le Pouldu embarked on a journey to distant lands ("to the Orient", as did Pavel Kuznetsov and Martiros Saryan later), Goncharova remained on her native soil, identifying Russia itself with the Orient. Later she wrote about "a great love in understanding the surrounding world and in the decorative style of imaging it" characteristic for "people living in the Orient, including Slavs [italics mine - CP. ]"8, and she preferred to refer to the statues from the Scythian burial mounds as "Russian" kamennaya babas, as already mentioned. 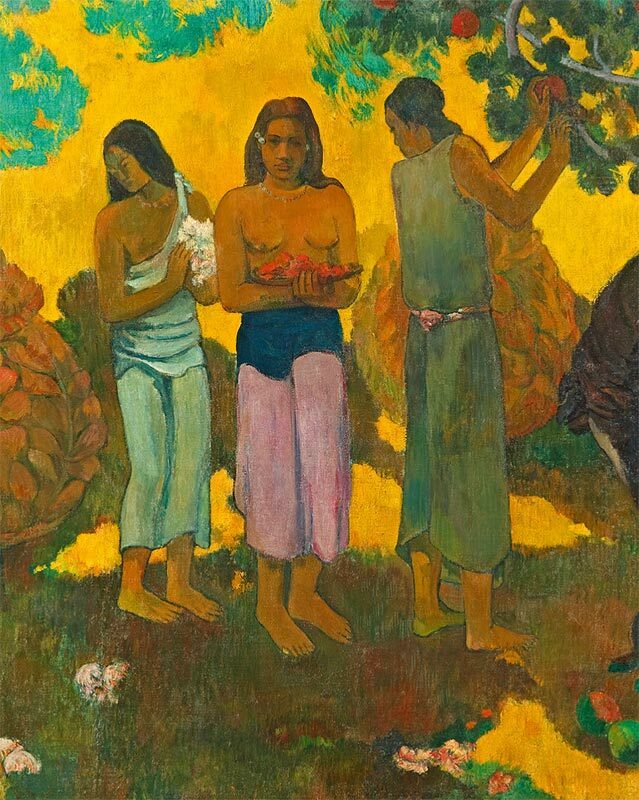 The figures in her compositions inspired by Gauguin's Tahitian women still appear to us as peasant women from Tula - this applies to the peasant women in "Merry-Go-Round" (1910, Serpukhov Museum of History and Fine Arts) or to the even earlier images in her "Fruit Harvest". It is true that in this series she teetered between the women from the villages around the Clothing Factory, whom she had known since her childhood, and the equally alluring Tahitian women painted by Gauguin. Nevertheless, most of these women are peasants from Kaluga or Tula, and only the woman holding a basket (from the picture featuring a woman bent over a pile of fruits) seems to have come from one of the French master's paintings. In Goncharova's compositions people are more firmly anchored in reality. Whereas the background in Gauguin's "Fruit Gathering" appears to us largely as a glittering golden mosaic, Goncharova's backdrops seem like sun-drenched lawns in a garden. In Gauguin's paintings spots of light, resting on the surface, form its radiant base, while in Goncharova's compositions they echo the sun-drenched space of the garden. Unlike Gauguin's weightless native people, who do not so much stand on the soil as appear "suspended" between beams of golden light, Goncharova's peasant women have their feet more firmly planted on the ground. The conceptual associations in Gauguin's paintings lure the viewer's imagination into the deep recesses of the artist's personal mythology, whereas in Goncharova's early pieces they guide the viewer towards the surface instead, into the bounds of a more condensed "national myth". 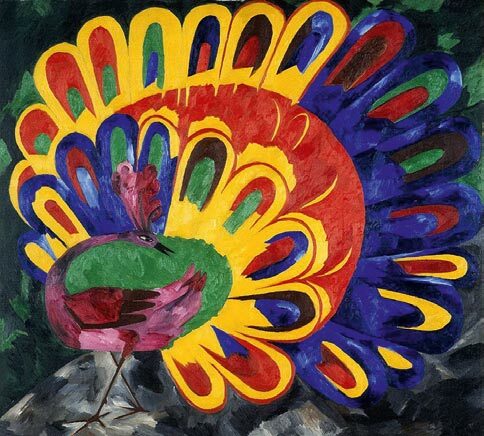 By the 1910s Goncharova's Gauguinesque period had come to an end, and her primitivist art moved into a new stage. Alexandre Benois, after a visit to her solo show in 1913, remarked that her compositions were "powerful and compelling", arguing that the "compactness of her paints" made one dream about Goncharova decorating entire walls of cathedrals9. If we imagine such a cathedral, her pieces from the 1900s, such as "Merry-Go-Round" or "Fruit Harvest", which are more narrative in style, would fit on the church's northern or southern walls, whereas the figures from the 1910-1911 pieces, such as the "Evangelists" (1911, Russian Museum), would look good on an apse or pillars, which were traditionally decorated with leaner images. Unlike Gauguin's Tahitians, Goncharova's "people from the pillars" are awkward, stocky, and resemble "dummies" with their feet planted on the earth. They either stretch their arms stiffly up to the fruits ("Picking Apples", 1911, Tretyakov Gallery) or walk heavily with a load ("Winter. Washerwomen", 1911, Russian Museum), astonishing the viewer with their drive and unstoppable motion ("Gathering Brushwood", 1911, Tretyakov Gallery), exhibiting the arduous rhythm of shifting the body's weight from one foot to another, as well as the perseverance in following the routines of toil learned by rote from time immemorial. "Gauguin. A View from Russia". Album. Russian section of the album compiled by Maria Bessonova. Moscow: 1989. 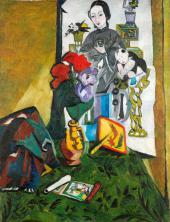 See: Semenova, N. "The Moscow Collectors". Moscow: 2010. Steneberg Ehrhard. 'Gontcharova, se penche sur son passe'. In:"Gontcharova et Larionov. Cinquante ans a Saint Germain-de-Pres. Temoignages et documents recueillis et presentes par Tatiana Loguine". Klincksieck-Paris, 1971. P. 214. (Translated by Ye. Ilukhina). "Tretyakov Gallery. Mikhail Larionov, Natalia Goncharova. Parisian Masterpieces. Paintings". Tretyakov Gallery, exhibition catalogue. Moscow. P. 161. "Russian Paintings and Drawings of the Late 19th-early 20th Centuries". Moscow: 2008. P. 267. We believe that this still-life was created earlier than 1910-1911, as suggested by the compilers of the catalogue"Natalia Goncharova. Her Russian Years" (Russian Museum, St. Petersburg, 2002, No. 114). The style of the work makes one believe that it belongs with the series of works created in 1908-1909. Bessonova, Marina. 'Gauguin's Legacy and the Modern Art'. In: "Gauguin. A View from Russia". Album. Moscow: 1989. P. 12. Exhibition of authentic icons and popular prints organised by Mikhail Larionov. Moscow, 1913. Benois, Alexandre. 'An Artist's Diary'. In:"Rech". 1913. October 21.